Typical multiple layered windows require a non-reacting, low-thermal-conductivity gas in the space between the glass layers. While argon is used at present in nearly all IGU's, a better choice thermally is (expensive) krypton, which is currently separated from dry, CO2-free air, by high-energy-consuming cryogenic distillation. This process has high operating costs and requires large volumes of material to process to achieve competitive economies of scale. A potential alternate process is separating krypton from dry, CO2-free air by absorption into an ionic liquid at ambient temperature. By comparison, the absorption process uses an ionic liquid that is preferentially selective to the inert gases relative to oxygen and will have lower operating costs and can be scaled to operate economically within smaller oxygen plant capacities, reducing the transportation and handling costs for intermediate oxygen stream. Preliminary analysis and testing indicate that selected nonvolatile ionic liquids exhibit good selectivity for krypton relative to oxygen and nitrogen, substantially above that of common volatile absorption solvents. 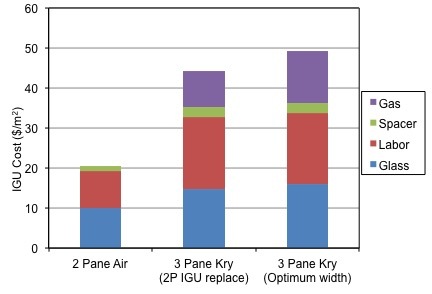 Highly insulating triple pane windows have been in the US market for many years but have historically seen limited penetration due to the significant added costs of three glass layers, added gas fill cost, additional low-e coating, bulkier frames, and specialized hardware to handle heavy sashes. For suspended film triple glazing windows, there is no added weight, but the production of suspended film units tend to be labor and energy intensive, resulting in comparable cost increase. These added costs prevent most homeowners from realizing an acceptable payback for their investment. Recent innovations in low-e coating technology, triple pane assembly line processes, and frame designs have brought these costs much lower though, and krypton is left as the high cost component of the system. 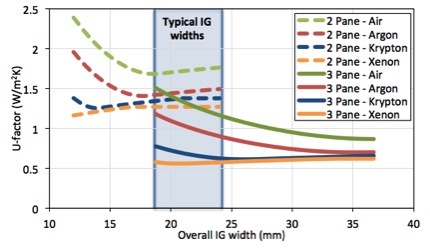 To illustrate the significant added cost which krypton adds to IGU's, Figure 4 shows the manufacturer's cost breakdown of three IGU configurations. Krypton currently comprises approximately 25% of the total IGU cost when added to an IGU. Krypton is currently ~100x more expensive than argon, which is prohibitively expensive for widespread market adoption. For the same reasons, xenon is an even better choice thermally than krypton but is another ~100x more expensive than krypton. Kr and Xe are also used for lighting, and electronics (a fast growing market). Unlike other industrial gases, rare-gases are global commodities and supplies are not always based on local production. The gap between worldwide supply and demand usually determines price. The world production of crude Kr/Xe is controlled by the three largest industrial gas companies with 80% market share: Air Liquide, Praxair, and Linde—plus Iceblick, an East European based company and the second largest global supplier of purified Kr/Xe. The current world production of gas mixture (approximately 90 % Kr, 8 % Xe, and 2% impurities) is around 111 million normal liters. USA produces 12 to 14 Million L of Kr/ Xe with Praxair having about 80 % market share. remove CO2 and H2O either using absorption, adsorption, or any other technique. After the removal of CH4 and other hydrocarbons, the stream is liquefied and cryogenically distilled to produce purity products. The buildup of hydrocarbons and their removal requires intensive downstream processing. This makes the process very expensive. Our process does not require separate removal of hydrocarbons from the feed and may not pose a safety threat. (Statistics are taken from March 2011 — CryoGas International pp 40-43).